I have to post one more project from back in Jan. so I can make a mosaic for the month. I'm not getting all my projects blogged but I'm doing much better than last year. I'm blogging the last thing I made in Jan. because it was a quick and easy project so it will be quick and easy to blog. Do you ever have to whip up something late at night for school the next day? I always seem to have this happen. This story is how an ice skating school trip had me sewing late one night. My kids got to go ice skating with the school because they both made A level honor roll. I was happy they got to go on this fun school trip. BUT! I was worried about Demi's little legs (silly me never thought to worry about this until after midnight the night before). The school requires girls to wear dresses/skirts even on school trips. I thought her legs might get cold skating on the ice all day so I made her some very warm striped leggings. I made them out of a striped sweat shirt (XL men's shirt) so they're thick and warm. I made them wide in the leg so she would have lots of room to move around (fall down and get back up on the ice). 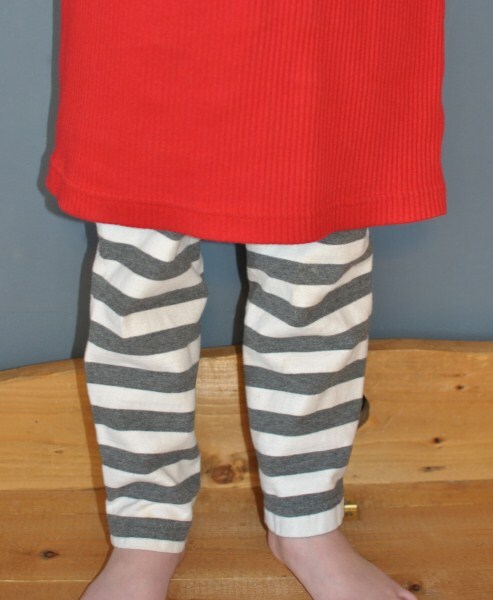 The striped leggings with this red sweater dress was a warm comfy outfit to play on the ice. This dress is one of the 7 Christmas dresses I made my girls (yes that's right I made SEVEN "Christmas dresses" for my 2 girls). This dress was originally made for her to wear to the school Christmas party. She needed to wear a dress that she could run and play active games in. This simple ribbed knit dress fit the bill (I made it in under 30 minutes from a ladies turtleneck sweater). It is a no frill dress because I had to follow the school's (no frill) dress code. The dress looks nicer with a belt but I thought a belt might bother her ice skating so she wore it like this to go skating. Keep reaching for the stars Demi (I have no idea what she's doing in the photo above but to me it looks like she's reaching). I'm sorry I had to go back to Jan. when I have so many other things I need to blog about from this month. It bothered me that I couldn't make an even mosaic with the projects I blogged about last month so this makes it all nice and even for me. Thanks for being so understanding. I will make 2 more pairs of leggings from that men's shirt soon. I can make 3 or 4 pairs of leggings out of an XL men's shirt. I like projects like leggings because they only take 10-15 minutes to do. I feel so much better knowing I can check Jan. off my to list. Now I need to find time to blog all the things I've made the last 9 days in Feb.